School fundraising is a time-honored tradition. Fundraisers help pay for everything from field trips to new books, and students often love getting involved with helping their school. At Qgiv, we see tons of neat online school fundraising activity. But for other kinds of school fundraisers, we lean on the expertise of others. That’s why we’re excited to learn about school fundraising from Matthew Fass, the founder and owner of ABC Fundraising® as well as a main contributor to The Fundraising Ideas Blog. Through ABC Fundraising®, Matthew helps schools, churches, youth sports teams and non-profits raise money using unique fundraising products. Since 1993, ABC Fundraising® has helped over 50,000 organizations in the United States raise over 50 million dollars. When it comes to fundraising for your school, figuring out the best ways to get your supporters excited can be tough. After all, your donor base is made up of a diverse mix of parents, teachers, community leaders, and even students! That’s a lot of different voices to listen to. Create smart online giving forms. Hold a scratch card school fundraiser. Sell school merchandise to raise money. Promote matching gifts to the community. Launch a discount card fundraiser. Fundraise on site at school events. Ready to dive into these expert school fundraising ideas? Let’s get started! 1. Create smart online giving forms. The best way to boost fundraising for your school? Create intuitive, user-friendly online giving forms! Online giving forms make donating to your school easy for all kinds of supporters. Since these forms are hosted over the internet, individuals can choose to give wherever they are, whenever is most convenient for them. Your school’s logo and colors. When your school has online giving forms on hand to make donating convenient for supporters, you’ll never have to worry about losing out on gifts. Because giving online takes just a few minutes, your school’s community will love to make online donations to all of your latest fundraising campaigns. 2. Hold a scratch card school fundraiser. There’s a new fundraising trend taking hold at schools that’s fun for the whole community: scratch card fundraising! Scratch card fundraising is a great way to reach your school’s fundraising goals fast. Volunteers approach their friends, family, and neighbors and ask them to scratch two circles off of their fundraising card. Under each circle is a small donation amount ($0.50-$3.00). Student clubs and after-school programs. Intramural and extramural sports teams. Music programs like your marching band and orchestra. Field trips and fun learning events. Spirit week fundraisers at the beginning and end of the year. Better yet, once a scratch card is finished your volunteer will have raised $100. Each card costs just $20 to order and ABC Fundraising will even give your school a 10% discount on each shipment. This gives scratch card fundraisers an average profit of 90%! Since every dollar counts, why not give scratch card fundraising a try? 3. Engage in peer-to-peer fundraising. Peer-to-peer fundraising is another online fundraising strategy that’s a perfect for for your school’s fundraising goals. In a peer-to-peer fundraising campaign, a school calls on community members to set up fundraising pages on their behalf. These individuals then reach out to their online networks and solicit donations for your school. Peer-to-peer fundraising isn’t simply a great way to raise money for your school; it’s also an excellent way to grow your school’s community of supporters! 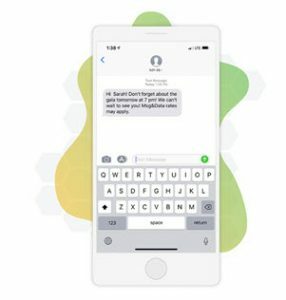 Since peer-to-peer fundraising campaigns are spread by your community members online, these campaigns will reach more eyes than ever when they’re shared on social media sites and emailed to friends and family. This way, your school’s donors don’t have to live in your community or even have a child at your school! 4. Sell school merchandise to raise money. Every school has a mascot, special colors, a motto, or other elements that make up your school’s identity. Help your teachers, students, and their family members show off their school spirit by selling merchandise to raise money! Your school can sell merchandise at a school store, at fundraising events, or even through an online storefront. School supplies like pens, pencils, notebooks, and erasers. Novelty gifts like mugs, towels, picture frames, and posters. Fun “toys” for students like stickers, bracelets, and games. Branded t-shirts that rep your school’s colors, mascot, and motto. In fact, selling t-shirts is one of the most profitable ways for a school to raise money! Check out this school’s t-shirt fundraising campaign. 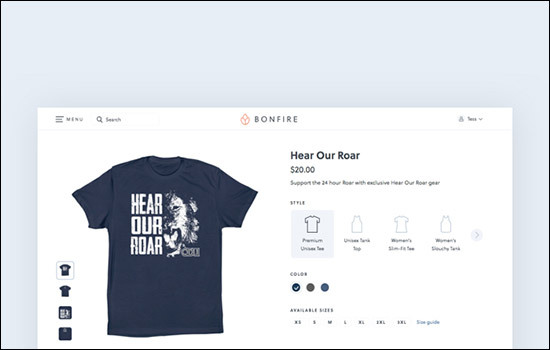 By customizing their merchandise to match their school’s identity, they’ve created a t-shirt fundraising product their school will love to promote and that their supporters will love to wear! 5. Promote matching gifts to the community. Did you know that there’s a way to double (or even triple) the impact of your school’s supporters without asking them to give again? Matching gifts programs are a form of corporate giving program in which an employer agrees to match their employees’ charitable donations. 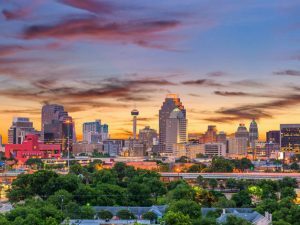 While these programs benefit your school, your supporters, and their companies, $6-$10 billion in donations goes unmatched each year simply because people are unaware that their company has a matching gifts program in place. Luckily, there’s an easy way for your school to boost matching gift revenue to your next fundraising campaign. Simply invest in the right matching gifts software and add a branded matching gifts database to your school’s website. Then, you can promote matching gifts to your school’s community in newsletters, email blasts, and even at fundraising events. Your supporters will love to learn there’s a way to get more from their gifts, and that might even be the push they need to give more often! 6. Launch a discount card fundraiser. Now, here’s a fundraising idea you’ve probably heard of before if you haven’t yet implemented it at your school: discount card fundraisers. Discount card fundraisers are a smart way to make giving back to your school a no-brainer for members of your community. 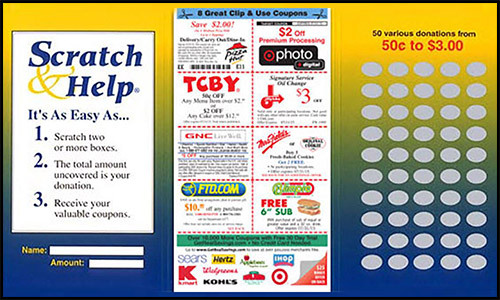 Individuals can purchase discount cards with coupons to local businesses. These cards may be worth hundreds of dollars saved for your donors! Your school can sell cards that cost $10, $15, or $20 and feature a customized set of local businesses. 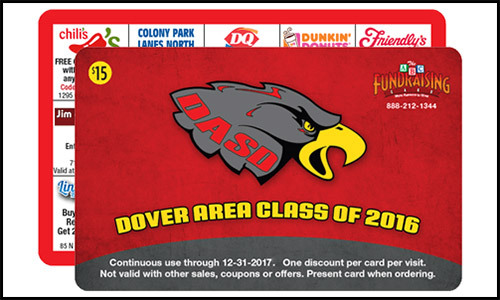 The deals offered on these cards last up to a year, so your school’s supporters will have plenty of time to get the most value from their purchase. Even better, since these cards are so popular, your school can expect that for each volunteer you have sign up to sell discount cards, they’ll yield 5-10 cards sold. That’s a gigantic return on your investment and it means you’ll reach your fundraising goals even quicker! 7. Fundraise on site at school events. One of the classic school fundraising methods is to collect donations at fundraising events like sports games, field days, and dances. However, with an on-site giving kiosk, your school can boost fundraising at these events even further. An on-site fundraising kiosk is just like your online giving form, but it allows individuals to pay in person at your fundraising events rather than online. Customize your interface to match your school’s identity. Quickly swipe cards for fast giving. Set up recurring gifts at the time of donation. Serve as a point-of-sales for merchandise fundraising. While not all of your supporters will want to give using a kiosk, having one on hand makes it possible for your school to collect gifts from those who find it convenient. Paired with your online giving forms and traditional cash and check gifts, this is a great way to round out your school’s fundraising strategy! Figuring out the best way to raise money for your school isn’t easy. However, with these awesome strategies in mind, your school is ready to rock your next fundraiser! Peer-to-Peer Fundraising: Everything Your Nonprofit Needs to Know. Want to become an expert on one of our favorite school fundraising ideas, peer-to-peer fundraising? Check out our in-depth guide to master this method! Double the Donation’s Fundraising Ideas for Schools. Looking for even more school fundraising ideas? Visit Double the Donation to find out their 61+ school fundraising ideas for all kinds of campaigns. 5 Top PayPal Alternatives for Nonprofits. Think PayPal is the only tool out there to process fundraising payments? Think again! Discover our favorite PayPal alternatives you can use at your next school fundraiser.